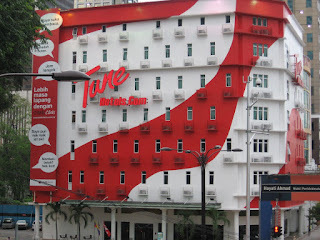 Anyone stayed at Tune Hotels.com at Jalan Tuanku Abdul Rahman in KL before? We stayed there during a 3-day course from 11-13 December 2007. It is only a few minutes walk to Medan Tuanku Monorail station, very convenient. It is two stations away from Wisma Genting where I attended my course. I kind of like the colour of its building, it is painted red & white, cute!! The room is cute too, pretty small I mean (the one I stayed). Guess what! We had to pay to utilise the air-conditioning (calculated base on hours) or else use the ceiling fan provided. There are no telephone nor room service. If you plan to stay at Tune Hotels, please get ready your own towels and toiletries. (Towels and toiletries are for sale at the check-in counter at reasonable prices). Don't bother to bring toilet rolls as it is provided, luckily....:). There are cafes, internet services and ATM machine at the ground floor of the hotel. You could visit their website at http://www.tunehotels.com/ for further information just like I did. If you expect to have services like 5-star hotel, then Tune Hotels is not a place for you. aunty j, it'll be at 1Borneo. You can see part of the building being painted red already..